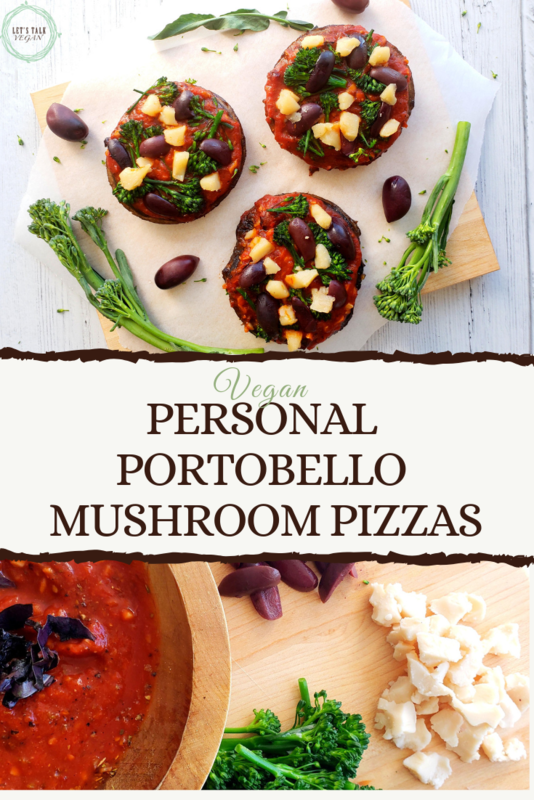 These portobello mushroom pizzas have tons of fresh, savory flavours, making this recipe an easy way to enjoy your favourite pizza toppings, guilt-free, without all the carbs. There really isn't much to not to like about pizza. You have a crispy crust, loads of savory tomato pizza sauce, gooey melted cheese, and then creative control over toppings. It's a pretty basic lineup, so let's make a new favourite! Start by cutting the stems off the broccolini, so that there are just florets left. Next, add the broccolini florets to a pot of boiling water. Cook for about 6-8 minutes or until the broccolini is a vibrant green colour. Why do veggies appear a brighter green when cooked? Well, chlorophyll pigments give plants their green colour, but when heated changes occur. There are tiny spaces between cells, and these spaces cloud our view of the cell's bright green chlorophyll. When heat is applied it breaks down the cell membrane, allowing the gas between the cells to escape. This reveals a bright-green chloroplast, causing the vegetable to look brighter. In a small bowl, mix together the pizza sauce, minced garlic, Italian seasoning, salt, pepper, and fresh chopped basil. Next, de-stem to mushroom to make room for all the toppings. Then, drizzle about 1/2 tbsp of olive oil over each mushroom, followed by the garlic sprinkled over top. Cook stem side down for about 5-10 minutes. This step will help release any water in the portobello mushrooms so that they don't get too watery when you add the toppings. 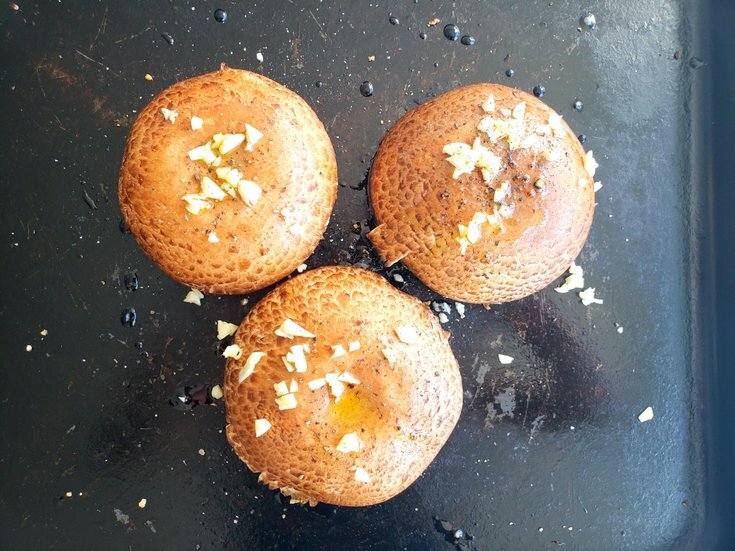 Once cooked, flip the mushroom caps over and pat any access water off with a paper towel. 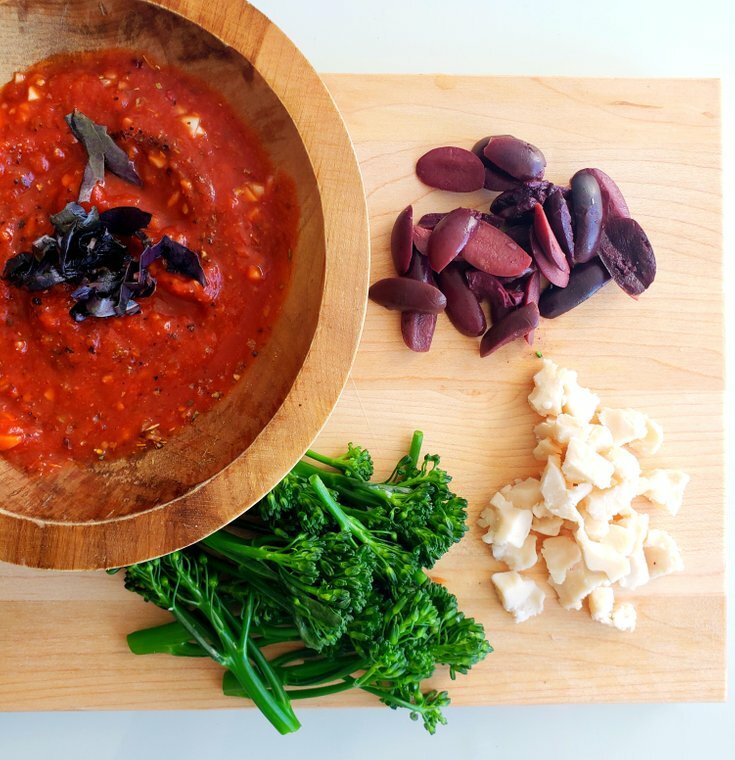 Then, add a couple of spoonfuls of pizza sauce, followed by the broccolini florets, a couple of slices of kalamata olives, and some crumbled vegan gouda cheese. Turn the oven to a high broil. 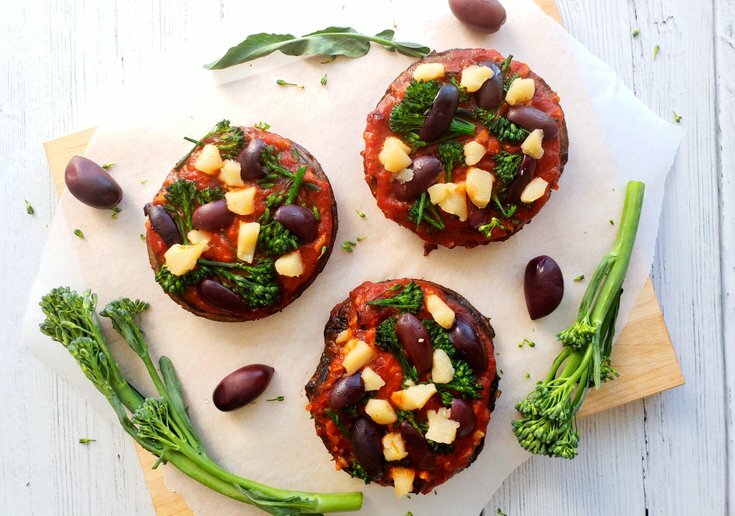 Then, place the portobello mushroom pizzas on a baking sheet and cook for 8-15 minutes or until everything is heated through. Cut the stems off the broccolini, so there are just florets left. Bring a pot of water to a boil, add the broccolini florets. Then, cook for 6-8 minutes or until broccolini is a vibrant green colour. In small bowl, mix together pizza sauce, garlic, Italian seasoning, salt, pepper, and fresh chopped basil. De-stem the mushroom, then drizzle about 1/2 tbsp of olive oil over each mushroom, followed by the garlic sprinkled over top. Cook, stem side down, for about 5-10 minutes to release water in the mushroom. Once cooked, flip mushroom over, pat any access water with paper towel. Then, add a couple spoonfuls of pizza sauce, followed by the broccolini florets, a couple slices of kalamata olives, and some crumbled vegan gouda cheese. 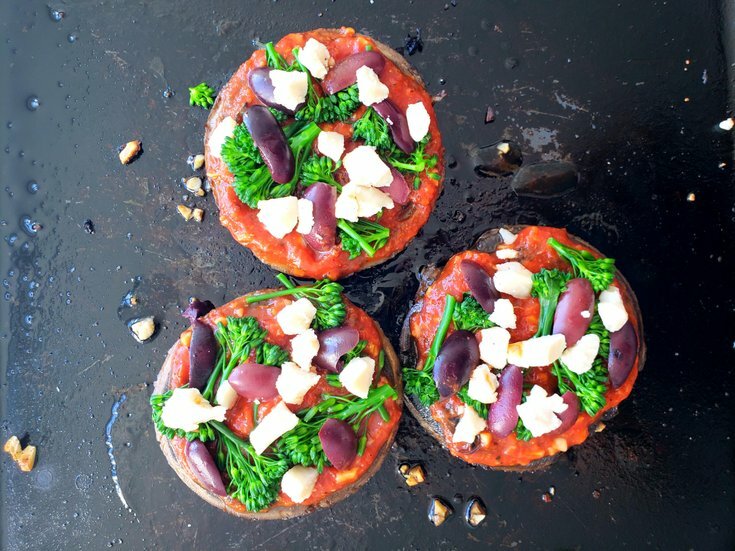 Turn oven to high broil and cook portobello mushroom pizzas for 8-15 minutes or until everything is heated through.